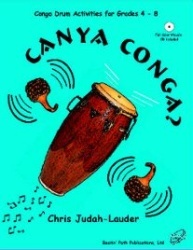 Appropriate for grades 4 - 8, CANYA CONGA? is a new book of drumming activities that is every bit as exciting and useful as Chris' first two books for Hand Drums, Hand Drums on the Move and to drum. The book is laid out with extensive lesson plans including objectives, process, and extension possibilities plus full scores for every activity. A disc is included with each book containing image files of each full size music score and a FULL COLOR VISUAL of each activity suitable for making transparencies or for use on a INTERACTIVE WHITEBOARD OR PRESENTATION STATION. This book will have all of your upper elementary and middle school students moving, creating, and drumming like never before.